If you have this question in mind, let me give you a virtual tour to ‘U’r campus. A fresher just de-boarded from the train at Udaipur City railway station with a hell lot of doubt about the campus of IIM Udaipur. It’s a new IIM that too in the outskirt of Udaipur, is it having enough facilities to accommodate such a large batch at this early stage? What about the classrooms, hostels, auditorium, library etc? with all these questions in mind, this guy took a cab and headed towards the institute. The greenery, peace, beautiful mountains and the pleasant rain already made him think that he is approaching towards a beautiful beginning. Reached the main gate of campus and saw that all the vehicles are parked there only, and they are not allowed inside the campus (except the bicycles). Indeed, what this guy heard about the green campus is true. Convincingly entered the gate and surprised to see the beautiful architecture of the campus and the lively environment. One senior came and escorted him for the registration formalities. Little chit chat with senior was enough to understand that why mutual respect and integrity are the core values of IIMU. Guy completed the formalities and headed towards his hostel…opened the door…OMG…could not expect more than this, a beautifully designed room with table, chair, bed, mattress, big cupboard, balcony with an awestruck view of mountains and not to forget AC :P. Outside the room, refrigerator, washing machine, printer, oven etc. Meeting greetings took place for some time with the batchmates, had a delicious supper in the mess which is in safe hands of Sarovar, thankfully, and then took a good night sleep. Next day, he has to go for the registration for the program. So, started moving towards the academic block and the registration was on the 3rd floor, entered the lift, pressed 3 and the lift started moving downwards….surprised?? ?….so he was…initially he was on the 6th floor itself. 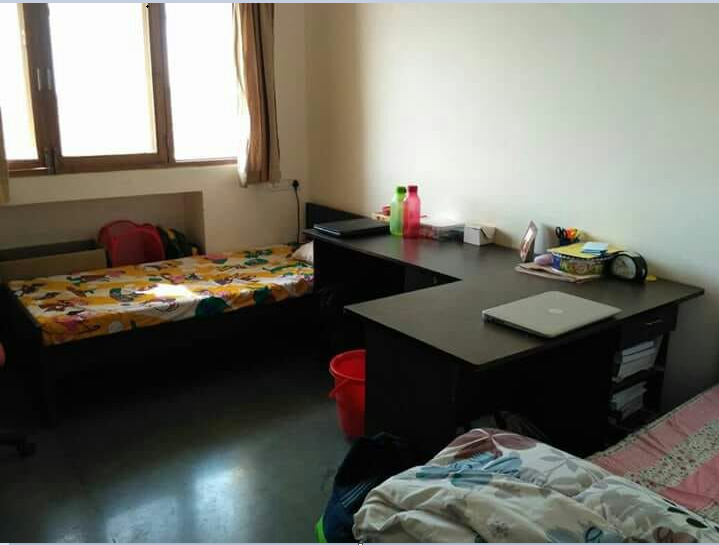 Now, you must have got some idea about the uniqueness of IIMU. Done with the registration, he went to explore other things, classes are on par with the best B-school around the world not only India. Big flamboyant auditorium, a library with countless books, a well-facilitated gym, a volleyball court, football ground and what not. Then the thought came into his mind that whatever his mentor told him, it is the replica of the same and why was he in doubt. With the Induction program in progress, he totally understood that IIMU sticks to its core values. The rules & regulations are uncompromised, the focus is on academic excellence and the transparency really exist there. The values are not just for the sake of writing but IIMU inculcates them in the heart of every individual. He felt relieved that his future is in safe hands and he is in the lap of the most beautiful campus surrounded by mountains and lakes. A lot more is yet to come since he has been there only for 2 weeks and it is difficult to explore 300 acres of campus with so many assignments, projects etc you know. The company I would like to work for is IDEA CELLULAR LIMITED which is under top 3 mobile operators in India. Since I’m an electronics and communication engineer from a reputed NIT and have a rich 4 years of work experience in Reliance Jio, the telecom sector has become my forte. I would love to utilise my understanding of telecom market, latest technologies and developments in that sector like IoT, 5G etc and managerial skills to help my organisation grow. Also, it will give me an opportunity to learn further under that domain and improve my skill set and become more efficient in my work.